(Kuu Wainohia) Senior dance exercises from MUVE are gentle and easy to dance along to. 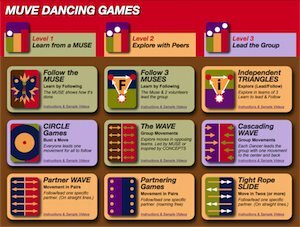 While children like to MUVE in dancing games, seniors generally like to follow along to the lead, dancer called the "Muse". When they follow, they do so "loosely." Because of the spontaneous nature of MUVE, following precisely is difficult and not at all necessary. The Muse gives you inspiration an you create the movements to your own needs. You can adjust size and speed to feel just right to you. Of course it will take a little practice, as we are not used to loosely follow other peoples moves. Yes, there is no choreography to forget! Yeah! Would love to order a DVD of your senior dance exercises but could not do it from your website. Kindly advise. It just looks fun. Aloha, We are happy that you share our enthusiasm for MUVE dancing. We pride ourselves with the creation of a dance system for every age, body and ability. We all deserve fun fitness. Unfortunately we do not sell the DVD’s anymore. Please utilize the dancing blog, every dance video we have created including those used in the DVD can be found on the the blog.